2)Take the dimensions of the specimen to the nearest 0.2mm. 3)Clean the bearing surface of the testing machine. 4)Place the specimen in the machine in such a manner that the load shall be applied to the opposite sides of the cube as cast. 5)Align the specimen centrally on the base plate of the machine. 6)Rotate the movable portion gently by hand so that it touches the top surface of the specimen. 7)Apply the load gradually without shock and continuously at the rate of 140 kg/cm2/min till the specimen fails. 8)Record the maximum load and note any unusual features in the type of failure. 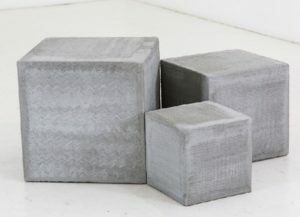 Compressive of concrete cubes at 7 ,14 and 28 days can be tested.